The attempted assassination of Representative Gabrielle Giffords in Arizona on January 8, 2011 spurred a surge of media reflection and criticism of the Tea Party Patriots and their violent rhetoric. The Coffee Party, created in 2010 as an oppositional force to the Tea Party, spent the days following the shooting discussing the various social, political, and moral aspects of the violence on their Facebook page. This chapter is part of an ongoing investigation of language in politically oriented online forums. Here, the 24 parent posts and following Facebook conversations are studied to investigate a connection between post sentiment and network structure. Using communication accommodation theory, Linguistic Inquiry Word Count (LIWC), and network analysis, a relationship is located between social, affective, cognitive, perceptual, and biological constructs and network measures of betweeness and core/periphery size. 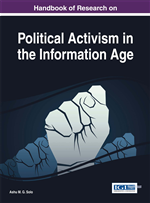 This chapter has implications regarding online network structures, new methods in Internet research, and online political activity research. The Coffee Party is a politically focused movement that began on Facebook in January 2010 as a means to “advocate for the interests of the American people without having our objectives, and the notions on which they are based, governed by powerful interests that already have too much influence in Washington” (CoffeePartyUSA about us, para. 1). As a self-described grassroots democracy movement, The Coffee Party states that their members come to their own conclusions through debate and discussion using facts and principles rather than the traditional rhetoric and ideology of political leaders and the media. Further, the movement relies on technology stating “thanks to new technology available on the Internet, we believe that Americans can meet the challenges of self-governance in the 21st century by becoming active citizens rather than periodic consumers of partisan entertainment (CoffeePartyUSA about us, para. 6). Because of the reliance on technology, the majority of the Coffee Party’s information distribution occurs through their website and their social networking page on Facebook. Most discussion by group members occurs through these channels as well. The Coffee Party also states that their mission is to fight the “cycle of corruption” which involves reforming campaign finance, taxes, and Wall Street (Mission statement, para. 1). Also a part of the cycle includes the “violent rhetoric” of the Tea Party Patriots CoffeePartyUSA about us, 00:05:11). Coffee Party creator Annabel Park states that the coffee party is not “the opposite of the tea party, but a response or alternative” (CoffeePartyUSA about us). According to Park, the origins of the Tea Party’s rhetoric comes from political culture and social structure which both government officials and the public respond to. After observing the rhetoric surrounding the healthcare debates of 2010, Park wanted to create an organization which focused on “core issues in the country” and overcame the rhetoric of the Tea Party Patriots which is destructive to progress and fixing the “real problems” (CoffeePartyUSA about us). These efforts were tested and demonstrated in the discussions on the group’s Facebook page. On January 8th, 2011 Representative Gabrielle Giffords was a shot in the head by attempted assassin Jared Lee Loughner during a “Congress on your corner” event in Casas Adobes, Arizona. During the incident, 19 people were shot, six of whom died from the injury. In the days that followed the shooting, an increased focus was placed on the role of the Tea Party Patriots and the mindset of Jared Lee Loughner. Slate.com writer Jacob Weisberg (2011, January 10) summarized much of the media’s and coffee party’s thoughts when stating “the Tea Party movement did make it appreciably more likely that a disturbed person like Loughner would react, would be able to react, and would not be prevented from reacting, in the crazy way he did” (“The tea party and the Tucson tragedy,” para. 2). Many blamed the incident on the far rights propaganda, rhetoric, and efforts to call into question the “legitimacy of U.S. government” (para. 3). Further, there was a connection drawn between the political rhetoric of the far right before the Oklahoma City bombing in 1995 and the backdrop to Loughner’s attack (para. 3). Because of the connections being drawn between the political far right, the Tea Party Patriots, and their critique of the U.S. government, the media coverage became heavily followed by political groups and the public. The Coffee Party’s responses and discussions of these connections were recorded on the groups Facebook page over the following week.